Abstract. The bird collection housed in Lubango, Angola, contains more than 40,000 skins, representing more than 850 taxa. As part of an atlas project for Angolan birds, we visited the skin collection for two weeks in June 2008, to extract distributional information from the specimens. The skin collection is still in good condition, and the Instituto Superior da Ciencias e Educacao (ISCED), which houses the collection, is to be commended for this. Data from labels of 15,000 skins were entered into an electronic database, including all specimens of lesser known species. The remaining 25,000 entries are being made from photographs of 'catalogue' cards. The most interesting specimens are four Slaty Egrets Egretta vinaceigula, the first records of this globally Vulnerable species in Angola. Other examples of interesting skins are illustrated in various photographs, drawing attention to the importance of the collection for systematic studies. A brief mention is also made of the mammal collection. Finally, a list of recommendations is given for the future management of the collection. Most Angolan weavers are represented in the collection, notable exceptions being Orange Ploceus aurantius and Slender-billed Weaver P. pelzelni. The collection generally contains few types, but it does house the type series of the subspecies of Scaly-feathered Finch Sporopipes squamifrons pallidus described by Pinto (1967). Several rare or uncommon weavers are represented: Black-chinned Weaver P. nigrimentus (2) [see photo: female with black head], Loango Weaver P. subpersonatus (2), Brown-capped Weaver P. insignis (5), Black Bishop Euplectes gierowii (1 from Tanzania) and Golden-backed Bishop E. aureus (47). 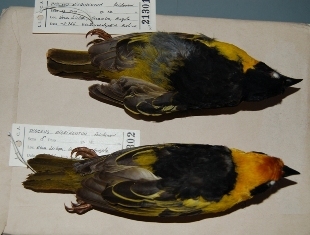 Three specimens of Southern Masked Weaver Ploceus velatus were collected by Pinto from the isolated Lake Dilolo during August 1958. The nearest locality to Dilolo for Southern Masked Weaver is in north-west Zambia.